That busy Texan Will Johnson (Centro-matic, Monsters of Folk) newest release is a personal, folkise effort that is noticeably morose and sparse, like the titled Scorpion skittering along the western deserts. Whispered vocals that barely rise above the fray at all even where there is little to no backing ("Truss of Ten") are the clear signature here. Johnson's breathy approach forces the listener to strain to hear what he is singing about behind acoustic strings and some well placed unique sounds. The instrumental "Rosanky" and the overall presentation recalls a somber Eels with less rhythm. The basic acoustic approach plays out in the title track but it is the switches away from the standard that work best. "Bloodkin Push" is a piano driven tune that contains a weird middle noise section that sounds slowly chaotic before the tune rights itself; add an odd diversion that pays off. "It Goes Away So Fast" also seems run of the mill until an electric guitar ripple reminds the listener of picking up out-land frequency's on a transistor radio late at night before a banjo plucks underneath. "Riding From Within" contains some acoustic angular strumming that works too. When Johnson stays straight ahead there isn't much to really invest in the tunes, the lyrics are so low that tracks like the disk closing "Vehicular and True", while obviously personal, are easily forgettable. The CD comes with the lyrics printed and that is a good thing as it helps the listener decipher Johnson's words. Keeping the listener engaged is where Scorpion stings strongest and the ever busy Johnson will no doubt be readying his next batch of tunes any minute now for us to listen to and enjoy. 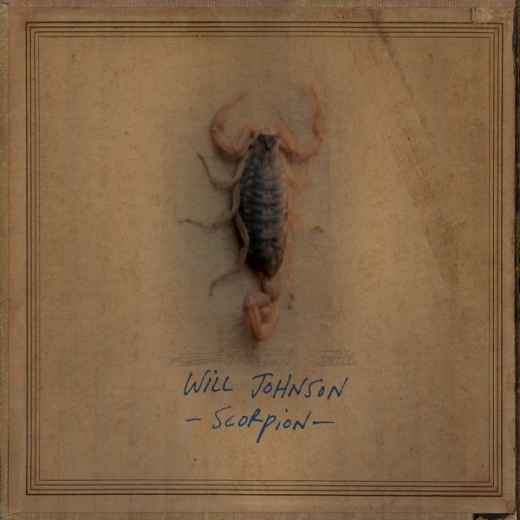 A pretty interesting disk from Will Johnson that is certainly on the downer side of things, but musically engaging at times to really capture the ear. I didn't know he drummed for Monsters of Folk, we love those guys here. Hope Will and he fellas put out some more good tunes this year. "You Will Be Here, Mine"